After last nights Port Ellen peat fest I thought I would continue the theme with some peated sherry monsters as follows in a mini H2H with some saved samples. I am grateful for getting hold of this sample, it is a great whisky. I was expecting much more peat to be honest but it may be dampened down due to the heavy sherry. Water is definitely not needed, great balance, a great cask bottled at the right time. Kept the price point at 90 so not to affect the score too much , 3-4 years ago this was roughly £1000 and to think I thought was expensive, now look at it. If I was to be critical it would be that a little more noticeable fruit would make this even better but it is a quality dram. Massive sherry, peat, coffee, stewed fruits of raspberry, blackberry, plum, prune and date. Some orange and bubble gum notes emerge but they are faint. Mixed in with the wood is mulled wine spice, smells really good. 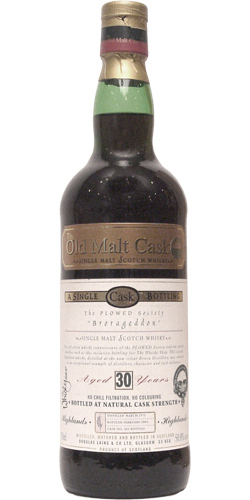 The sherry is big but the peat is huge and it combines very well and it is quite syrupy. It settles down very quickly and gets quite dry on pastry and wafer notes. Initially the fruit that the nose hinted at is hard to detect but the sherry is pretty flawless I have to say. This is no sherry or peat monster, not like I was expecting but I mean that in a good way, the balance is near perfect. The fruits come through now its all a stewed dark fruit salad mixed in with coffee. The wood is singing loudly now , you feel it mixing with the sherry but it is not overpowering. Red plums come in towards the end and damson jam. Not as long as I thought it would be but everything is well perfect. Forget a double Espresso, this is the way to start the day. notes. I've sniffed and gone to heaven. More stewed very bitter oranges, but tinged with a little sulphur. Leathery and delicious. An explosion of spices that gives waves of sensation that keep on coming for ages. The coffee lingers until the end. 1972 was a particular year for Brora, including many exceptional bottles, with all single casks sherry versions bottled by Douglas Laing.